Ozarks Water Watch will use grant funds to provide a hands-on interactive science-based day in the spring of 2019 at Lake Atalanta for 250 7th graders from Elmwood Middle School in Rogers, Arkansas. This field trip will be carried out in partnership with Elmwood Middle School teachers and administration. Students will visit stations where they will learn about a specific aspect of ecology or environmental science. Students will collect, record, interpret, and present their data as part of their field trip experience. Stations will be directed by a professional in the field who can help to direct student learning. Field trip stations will include macroinvertebrate study, water chemistry, soil testing, Secchi disk reading, Hobbs State Park Interpreter, stream discharge, nature scavenger hunt, and geology of the Ozarks. The goals of the field trip are for students to have a hands-on outdoor ecology experience to assist them in reaching proficiency in three units of the 7th science standards. Angela anticipates the field trip will build students’ investigative skills while their learn about the environment around them, improve student awareness about a local park and the recreational and natural resources it offers, expand student knowledge of what environmental science and professional environmental work can offer them in the future, increase proficiency in state science standards, and provide students with an opportunity to engage in field science, where outcomes can be unexpected. 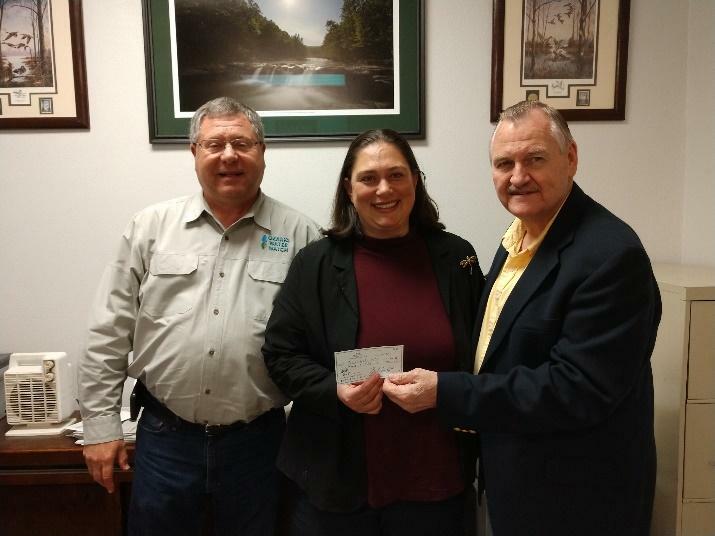 David Casaletto, Executive Director, and Angela Danovi, Regional Projects Director of Ozarks Water Watch receive grant money from Larry Kenemore, AEEA Board member. 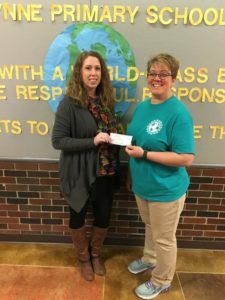 Teacher Kimberly Armstrong at Wynne Primary School will use grant funds for a raised vegetable garden that will benefit all kindergarten through second grade students. The high school shop teacher has volunteered his students to build the raised garden planter, and the primary students will be responsible for planting, weeding, watering and harvesting. Kimberly teaches about plants each spring to all three grades at various degrees depending on their state standard. The lessons range from the parts of the plant and seed, type of seeds, needs of plants, how seeds travel, and pollination. The goal is to start with one raised bed and expand when possible. The outdoor garden will be a valuable extension to these current lessons. Second grade students grow and pollinate sugar peas in the classroom using a Q-tip to transfer pollen from the pistil on one plant to the other. A raised garden planter would allow the students to transfer the seedlings started indoors to the outdoors when the weather is appropriate. Students will be able to continue viewing the life cycle as the plants are pollinated and produce vegetables. The garden would also be an asset to the P.E. coach as he teaches the food pyramid and discusses vegetables. The possibilities for extending lessons to enhance teaching through the garden are limitless as students make real-life connections to the vegetables grown in the garden. This will increase the student’s ability to take what they learned from books and resources and apply their knowledge using real life situations. The students will be able to comprehend how living things need food, sunlight, and water to grow as they observe and take care of the garden. Students will be able to see first-hand how the plants change throughout the life cycle. Evaluation of student growth and learning will be through discussions, journal entries, and observations during hands on experiences involving the garden. 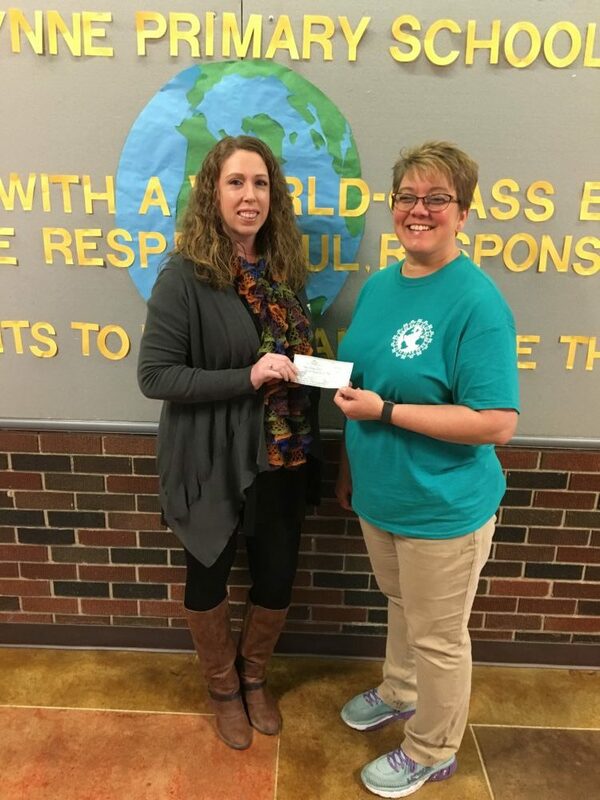 Tiffany Dunn, AEEA Board President, presents Kimberly Armstrong with a grant award. The grant cycle will open again in fall 2019. If you are interested in applying for a grant, watch our Facebook page and read the newsletter. 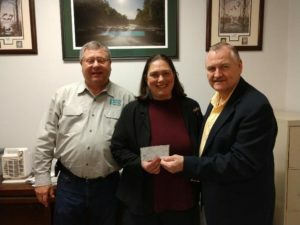 Beaver Watershed Alliance will use funds to help launch their “Native Landscaping Program,” which seeks to establish or increase native vegetation on five public grounds in the Beaver Lake Watershed and increase learning among citizens regarding the vital role that native plants play in our environment. The message of the program will be to use native plants in the landscape that benefit wildlife habitat, water quality, and natural heritage. The native plantings will be accompanied by presentations to school classes and placement of interpretive signage that will convey the benefits that native plants provide for water quality and a variety of birds, mammals, amphibians, reptiles and insects. Two native plant workshops will also be conducted for adults to help promote the benefits of native plants to the environment. For more information on the Beaver Watershed Alliance, please visit http://www.beaverwatershedalliance.org/. This project is an initiation into environmental education for many of our elementary students. Our summer garden project teaches students how to care for gardens over an extended time, wildlife interactions of insects, mammals and birds that help the garden grow organically, and it also helps students apply math, science and language skills they have learned during the academic year in a real life setting. By enabling students to experience vocabulary, writing, measurement, and scientific observation in the garden we help them understand their direct responsibility to be good guardians of the earth. The summer garden program will have long term effects by inspiring community gardens in surrounding neighborhoods, welcoming parents and children to our school, and encouraging them to become responsible environmentalists. Many parents come with their children during the summer program to work and learn in the garden. They take produce home with them and learn new gardening techniques while they are here. The garden program has proven to be a worthwhile form of communication between the school and families of our multicultural community. It expands vocabulary, knowledge of environmental awareness and a sense of responsibility to care for our wildlife. The Birder Backpack is a popular activity for park visitors. It has been checked out over 100 times in the past year. Park visitors have to “sign-up” to check it out and leave a deposit (although no fee is collected). Park visitors are given bird check lists to take with them during their outing. Mostly the birder backpack is checked out by families that would not ordinarily bird. Many times novice birders observe and identify birds around the feeders such as cardinals, robins, gold finches, blue jays, etc. For many visitors, this is their first birder experience and it gets them excited about birding and makes them more aware of their surroundings. One example to share of a unique experience is when a family checked out the birder backpack and took it to Yellow Rock to try to call in a Scarlet Tanager – and they did! The birder backpack has been a great addition to our educational programs and we look forward to encouraging more birding excursions at the park. A successful outdoor classroom led a teacher to have a greater interest to bring nature into the classroom all year long with a butterfly garden. The means to accomplish interaction with nature regardless of the season presented more than a challenge but also a learning opportunity about the natural world. A valuable lesson was learned, butterflies’ natural environment provides the best place for their survival and the irregular indoor temperature at school (with air conditioning) provided a surrounding that was not conducive to their survival. As Ms. Trotter explained, “Science is unpredictable and many variables affect how a project will turn out.” Even though all the resources were available – netting, growing lights, and plants – the room temperature inhibited plant growth and the success of the butterfly garden. As with any science project; it is trial and error. Ms. Trotter will modify the project in upcoming school years to improve on its success.